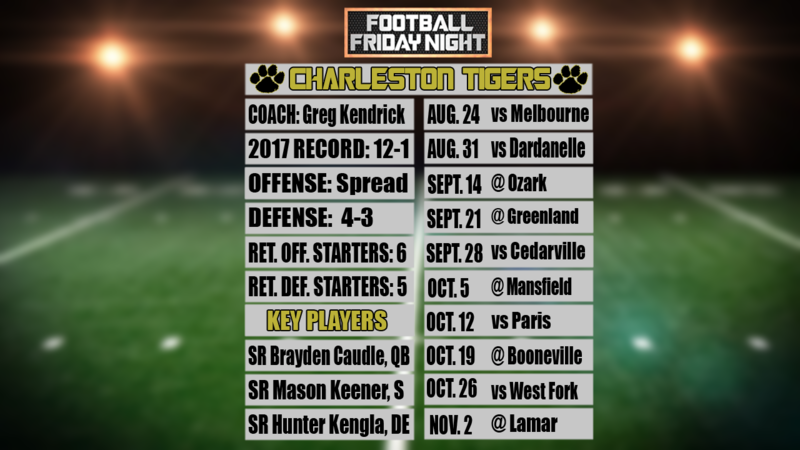 CHARLESTON (KFSM) - It's no secret that Charleston has been known for their offense over the past five years. After all, the Tigers have averaged more than 38 points per contest over that span. But their defense deserves a little more credit. Charleston has allowed just 16.1 points per game since the start of the 2013 season, a stretch in which the Tigers have gone 61-7 and played in three state title games. "Offense gets all the credit and the praise and glory but we win a lot of games defensively," Charleston coach Greg Kendrick said. "That’s something that kind of gets overshadowed here by our offensive numbers but we’ve been really, really sound and our kids take great pride in the defensive side of the football. That’s well established here and will continue." The Tigers went 12-1 last season and allowed just 219 points but this year's team think they can be even better. "I’m really excited about our defense," Charleston safety Mason Keener said. "I think, from last year I think we’re probably more physical than we were last year. Coach Stewart does a great job but yeah, I think we got a real good chance with our defense this year." Keener leads the Tigers' secondary as he had a team high four interceptions a season ago, two of which were returned for touchdowns. "Physicality. Coach Stewart has stepped in and filled the role from our ex-defensive coordinator, coach Hobbs, and he’s preached and preached physicality," Charleston defensive end Hunter Kengla said. "When we’re out in practice we smoke each other and we bring it in the game and as long as we hit hard this year, I believe we’ll take it far." Charleston kicks off the season on Aug. 24 as they face Melbourne at a neutral site, Hendrix College in Conway.